In the first of our three-part series, The Furrow looks at how three ranches survive in the "House of the Sun." Few people realize that Hawaii — as famous for its sugar and pineapple as for its luscious beaches — is also cattle country. It has been ever since 1793 when the British explorer George Vancouver shipped a small herd — seven cows and two seasick bulls, according to a history from the Hawaii Department of Agriculture — from Alta, California as a gift for the king. Today, about 760,000 acres of the state’s 4.2 million acres are in pastureland — comprising 83 percent of all productive agricultural land in the state, according to a University of Hawaii study published in 2015. Maui’s ranches are cow-calf operations, with permanent herds producing calves for sale to be raised, finished, and slaughtered for beef. Maui once had its own finishing feedlots and slaughterhouses, but the lots closed in the early 1990s when the costs of imported feed soared. Ranchers adapted by working with cargo shippers to send calves to the U.S. mainland for finishing and slaughter. Some 60 to 70 percent of calves annually are weaned at 6 to 10 months of age and transported to the mainland, where some are sold to be feedlot grain-finished, and a smaller percentage are finished by grass or grain on farmland owned by the Hawaii-based rancher. While many island ranches have sold off portions or subdivided, a few properties haven’t changed much. Kaupo Ranch is famously one of the least altered. 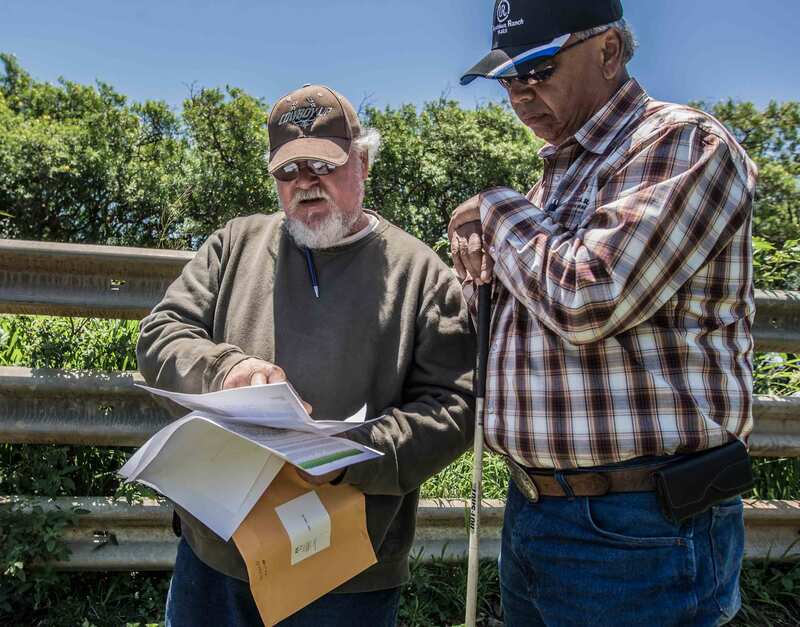 Kaupo Ranch manager Bobby Ferreira and Ulupalakua manager Jimmy Gomes confer on the prices of bulls. Far Out: The property is part of a larger area that gets its name from Kaupo Gap, a rift in the mountainside that opened during a landslide more than 100,000 years ago. The slide shoved massive amounts of earth and soil onto an area where the ranch now operates, according to Ferreira. The rugged land feels remote and wild, a world away from the tableaus of resorts and sugar cane fields that travelers see on the rest of Maui. Early Polynesians divided the land economically into wedge shapes known as ahupua’a that extended between valley ridges from the crater through to the ocean. The divisions gave early family groups access to various resources at different elevations, including sea life, timber stands, fresh water, and arable land. Kaupo Ranch still holds most of its original shape, according to Ferreira. Ferreira is known widely for his work pioneering an Angus Plus derivative species well adapted to mountain tropics. (Angus Plus are Bos Indicus/Angus derivatives, combining a minimum of 50 percent Angus with a floating percentage of Brahman, Ferreira says.) He also won recognition recently for transitioning the pastures of a previous ranch from fallow sugarcane fields to legume-grass mixes that support productive forage finishing. At Kaupo, he oversees 1,300 head of cattle; because of recent drought conditions, that number has been temporarily reduced from the ranch’s carrying capacity of 1,800 head, he says. 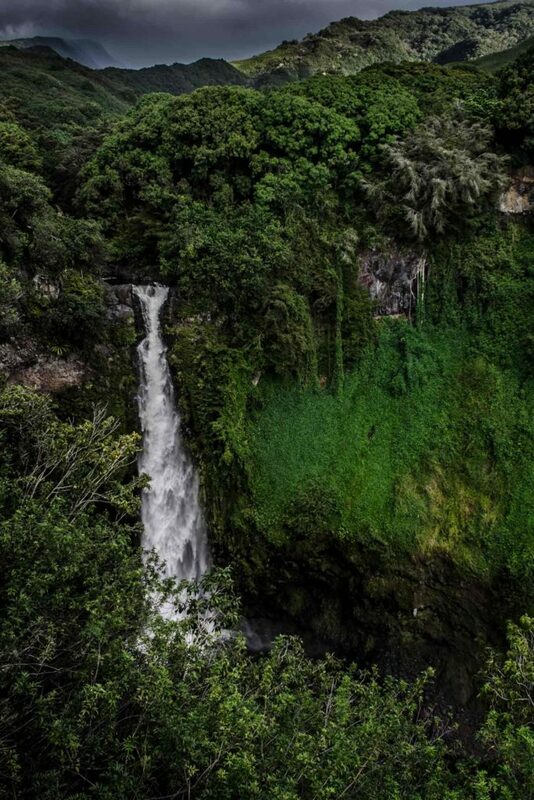 The waterfalls of the Seven Sacred Pools, near Kaupo Ranch. Wind and Rain: It’s hard to imagine that a tropical place like Hawaii experiences droughts. The archipelago lies in the northern portion of the equatorial zone, where prevailing northeast trade winds deposit moisture in highly localized patterns. When the winds — after traveling many miles across the ocean — reach Haleakala, they split and stream around the mountain like currents of water. According to University of Hawaii meteorologist Pau-Shin Chu, trade winds have been diminishing recently and shifting slightly from north to east. Between about 2007 and 2013 they delivered significantly less water to Maui and the other islands in the Hawaiian chain. That was followed by a year that delivered closer to normal rain, but then that was followed by the current El Nino cycle and less rainfall on the islands. It’s been an alarming trend, Chu says. “We’ve seen this decreasing trend over the past 40 years, since the 1970s,” he says. Where and when the rain falls depends on the property’s mountainside location and its exposure to the winds. On north- and east-facing slopes, trade winds deliver as much as 200 inches a year; on the southern or lee sides, the rain is blocked by Haleakala, and the ranches tend to receive much less, Chu says. Kaupo is on the lee side. But Kaupo benefits from a second wind effect. While the trade winds dominate 70 to 80 percent of the year — most prevalent in summer — another wind pattern, the Kona, supplies light moisture from the opposite direction, south and southwest, during the fall. Another factor affecting Kaupo and the other Haleakala ranches is elevation. Air temperatures change as the volcano’s slopes rise. Grass is available year-round at one elevation or another, but different species are associated with different heights. Lower slopes grow tropical grasses and legumes, while higher sections grow a mix of tropical and temperate zone species. Only a small number of tourists make the drive all the way around the volcano to Kaupo. When they reach the little community, they see scattered houses, a church and a single general store. The ranch and the store are Kaupo’s primary employers, Ferreira says, providing jobs for fewer than a dozen people. The ranch’s owners include the daughter of the man who bought the ranch in 1929, William Dwight Baldwin, himself a descendent of missionaries who arrived on the island in the 1830s. The current consortium of owners is planning to continuing its traditions, Ferreira says. Guinea fowl handle pesky insects with ease. In the second of our three-part series, The Furrow looks at how three ranches survive in the "House of the Sun."